Pfaff sewing machines have been around for 140 years. In that time, they have continued to grow and thrive in our ever changing economy. It’s their ability to stand the test of time that alway impressed us at Dublin Sewing Center. 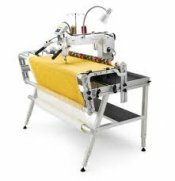 Pfaff succeeds at remaining in touch with the needs of the marketplace, while also understanding the desires of sewists throughout the world, and meet these needs by designing constantly evolving and improving sewing products.